MusicTutors is a nationwide music school where the lessons take place at yours or the tutors home. We take the hassle and stress out of finding the perfect music tutor. All our tutors have been fully vetted. We only work with professional, high-quality tutors who have the highest level of background check (enhanced DBS). You can search and chat with our tutors, schedule and pay for the lessons right here on our secure website. Either pay as you go, or buy a flexible block of lessons to save time and money. See the FAQ section for more information on how to pay. We believe that everybody should have the chance to experience a brilliant music education. Whether you are a parent wanting to give your child the best possible start or an adult wanting to begin or continue your own musical journey, MusicTutors makes learning music easy, enjoyable and as safe as possible. Solo lessons: One to One music tuition. We have gathered a list of the most frequently asked questions here. We have tried answering them to the best of our ability, but if you do have any questions, please get in touch at [email protected] . Our tutor profiles allow you to check out everything that could be a concern to you when booking your lessons, from the practical and logistical side of your lessons, to the genre, your level, and the learning style that suits you best. You can also have initial conversations with any tutors you like the look of before booking anything. Don’t forget; our team here are all experienced music educators and know our network of tutors very well, so we’re always happy to help you with your first steps towards booking the right tutor. How do I know that my tutor is safe, reliable and qualified? Our team are very committed to safeguarding and take it very seriously. Through our vetting and recruitment process, our tutors must produce a valid and unblemished DBS certificate, as well as agreeing to sign a code of ethical and professional conduct. Furthermore, it is necessary to the affiliation with Music Tutors that all our tutors have at least four years experience in teaching or a degree level qualification from a University of Conservatoire in a musical discipline. Click the link at the bottom of this page to apply. We’re based out of Mabgate Mills in Leeds City Centre. Why not pop in for a coffee sometime? We are an online platform helping to make the learning of music more accessible to everyone. You choose what you’d like to learn, where you’d like to learn it and which tutor you think suits you best. Before you know it, you're re musical journey has begun. What kind of teaching can you find at Music Tutors? Our tutoring is primarily one-to-one, and we are constantly talking to new tutors in different regions and different disciplines. If you cannot find a tutor in your area or a teaching method that you feel would benefit you the most, get in touch and we will help you to find a teaching style that suits you! In most cases, you have to bring your own instrument to your lesson unless advised otherwise by your tutor (excluding piano and drums). You can have these discussions with your tutor to establish exactly what you’ll need to bring your lesson . What if I am not satisfied with my new tutor? We are sure that your tutor will give you the best possible music experience, but if you are not satisfied please get in touch with us and we will happily help you find another tutor. What is the cost of the lessons? Our tutor's prices are based on their experience and their location. These prices range from £14 to £27.50 for a 30 minute lesson. If you want to receive lessons in your own home, a transport fee will be charged in addition. It is possible to order lessons of 30, 45 and 60 minute slots. There will soon be some exciting videos for both students and tutors. Experienced tutor and musician working mainly in jazz, groove and pop styles. 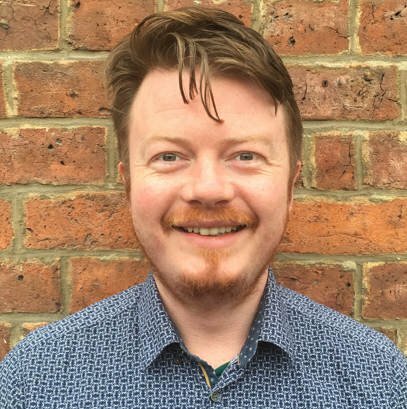 Based in Leeds with a young family, he is passionate about giving great service to everyone in the Music Tutors community and bringing the joy of making music to as many people as possible. Katherine is a researcher at Music Tutors, often having friendly chats with tutors and helping users with the site. She has been training and working as a musician for many years and loves to share her passion for the arts with others. She has a wide variety of experience playing with different ensembles in venues across the UK. In her spare time, Katherine enjoys baking, practising yoga and playing Nintendo. Tom is a guitar teacher and recent graduate of Leeds College of Music. He is enthusiastic about bringing joy to others through the making and teaching of music, as well as being an active musician in the Leeds area performing in a variety of venues. He likes to travel and take full advantage of the cultural events around him. You create an inquiry for the tutor via the tutor's profile site by pressing the green button 'send message'. Afterwards, MusicTutors and the tutor will be in touch to welcome you and answer any questions you may have. The next step is to arrange your first lesson with the tutor which will be confirmed via an email from MusicTutors. When you have confirmed the first lesson, you can log onto the website and view details about your tutor, get an overview of payment and see any comments the tutor may have. You will also be able to purchase further single lessons or a flexible block of lessons. Most of our students purchase a block after their first lesson. After purchasing a block of between 1 and 20 lessons, you will be able to arrange a schedule with the tutor, which can either be for a set time on a set day or a more flexible arrangement. MusicTutors's office is open from 10:00 to 16:00 Monday to Friday. By calling or writing to us, you can get guidance and get answers to any questions you might have. Lessons are always pre-paid. Unfortunately, you are not able to pay for the lessons afterwards. When logged into the website you have an overview of your payments. The payment is carried out via a secure payment solution delivered by E-PAY (Bambora). Whether you buy a single lesson or a flexible block of lessons, payment is withdrawn the same day as the purchase is made. You can get more information by contacting the office. We accept: Visa, Visa Electron and Mastercard. You are always able to change your lesson times within the tutor's available times. You can request changing the times of your lessons and,if necessary, cancellation by writing to [email protected] or your tutor. Remember to inform your tutor and/or MusicTutors.co.uk at least 7 days before when cancelling and 24 hours before when moving the lesson. We do not reimburse booked lessons unless they are cancelled at least 7 days before they are due to take place. When cancelling earlier than 7 days before the lesson is due, we will refund the paid amount. To cancel a lesson, contact our office. If the tutor cancels a lesson it will be refunded without charge or moved to another date which suites the student. If you get ill over a longer period of time and have lessons booked you should contact MusicTutors.co.uk via email or by phone. MusicTutors.co.uk, from time to time may take images / videos of lessons, concerts and similar, for use in brochures, press releases, posters, websites and social media. Please let us know if you would not like your, or your childs image to be used in this way. MusicTutors.co.uk only works with high-quality, professional and certified tutors with relevant education and experience. MusicTutors takes responsibility for delivering music teaching of a high standard. If, against expectations, you are not satisfied with the tuition, contact MusicTutors.co.uk immediateley after the lesson. At MusicTutors.co.uk you do not need to have lessons on a set day or time every week. For some, having a set time is best and this can be arranged with the tutor. Lessons take either 30, 45, or 60 minutes. Why do we have different prices? At MusicTutors.co.uk,once you have found the right tutor and are happy to continue, you may wish to consder block booking in advance. You can save up to 10% on the cost of lessons and booking is simple. At MusicTutors.co.uk there are 6 price rates for the lessons. We have a high standard of tutoring and the prices are therefore based on the tutor's experience. Are you already a student with us? If you are a student and have had your first lesson, you can log on to the website to view your lessons or purchase a block of lessons. You are always welcome to get in touch with us via phone or email if you need help. Click here to log into your student account! Do you want to become a student? If you are not yet a student you can either search for a tutor under find teaching or you are welcome to contact us via phone or email.